Bacon is tasty. Bacon from a locally cured organic pig is wondrous. It’s rich and full of porky goodness but never too salty. As my friend Brett Laidlaw says on his fantastic blog Trout Caviar, homemade (or locally produced) bacon is worlds away from nitrate-laden, overly preserved, inexpensive grocery store bacon. The key to preparing fairly healthy dishes that are still enticingly delicious is using less nutritious flavor bombs like bacon in small amounts to maximize the flavor without necessitating a call to the cardiologist. It really doesn’t take a large quantity for bacon to be a star. I’ve used our bacon before, in BLT risotto. 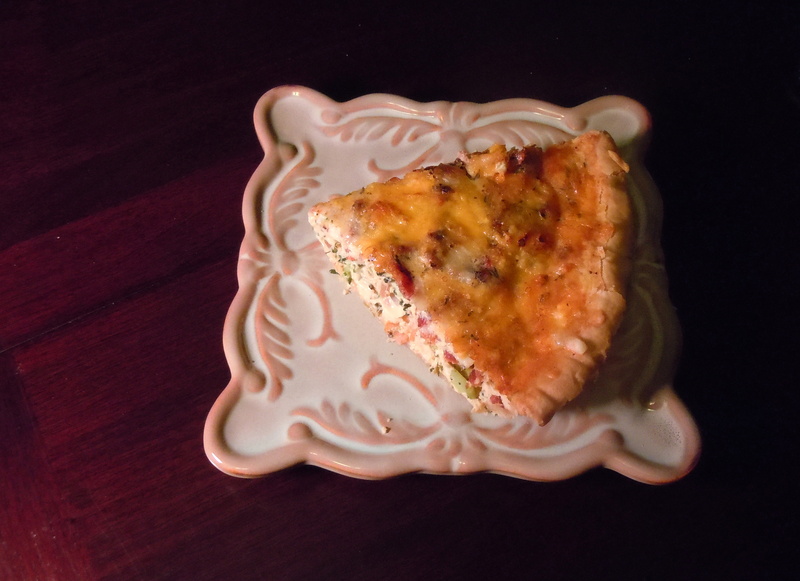 We happened to have a lot of eggs, so this time bacon quiche was the logical choice. Cleo and Libby were crashed after a long hike, but the scent of bacon woke them right up. They each got a small spoonful of bacon fat stirred into their food. Top Chef and The Chew host Carla Hall says that she likes a proportion of 1 egg per 1/2 cup milk (or cream) for her quiche base, which makes a light, creamy custard. 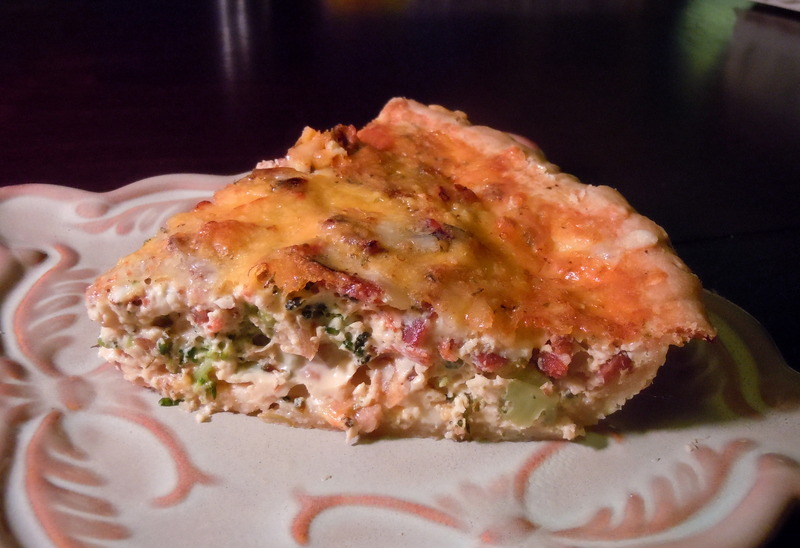 I prefer a firmer, eggier quiche, so I use 2 ounces (1/4 cup) milk per egg. Adjust proportions as you see fit. If you’re feeling decadent, use cream instead of milk. If you’re feeling virtuous you can use 1 or 2 percent milk and less cheese. If you’re saintlike you can skip the bacon and the crust, and use half the cheese, but where’s the fun in that? I am absolutely terrible at making a short pastry, otherwise known as pie dough. Cardboard comes to mind when describing my pastry. I know the theory; I just can’t create it in actuality. Yet. So I buy premade crusts. Anything — and I do mean anything — would be better than my current attempts. Broccoli adds a green, healthy element to balance that fabulously fatty bacon and cheese. I used roasted bacon left over from the previous night’s dinner, but steamed or sautéed broccoli would be fine as well. Swiss cheese is traditional in quiche, but Luke’s not fond of it, so I used a mixture of gruyère and sharp cheddar. Use what makes you happy, as long as it melts well. The bacon will not continue to cook in the quiche, so cook it to your preferred doneness ahead of time. While well-cooked bacon is undeniably fabulous, raw bacon is … well, it’s not good. Heat the oven to 375 degrees F. Line the crust with foil or parchment, and weight down with pie weights or dry beans. Bake for 15 minutes. Remove the weights and foil; bake for 3 minutes longer. Set crust aside but don’t shut the oven off. While the crust is baking, cook the bacon over medium heat until crisp and well-browned. Place on paper towels to drain. Pour off most of the fat. Add the onion and garlic to the pan; cook for 5-8 minutes until onion is tender and lightly browned. Add the broccoli and cook for 2 minutes longer, just to meld the flavors. In a small bowl (I use a quart-sized measuring cup, which makes it easy to pour), beat the eggs. Whisk in the milk, salt and pepper. Grate in the nutmeg, then stir in thyme. Let the quiche rest for 5-10 minutes before cutting. Serve hot or warm. This is one of Tom’s favorite vegetables. My sisters top theirs with a squeeze of lemon juice, a sprinkle of Aleppo pepper flakes, and/or a few shavings of good parmesan. Leftovers are perfect not only for the quiche but also for a broccoli version of the Orzo Salad with Green Beans and Olives. 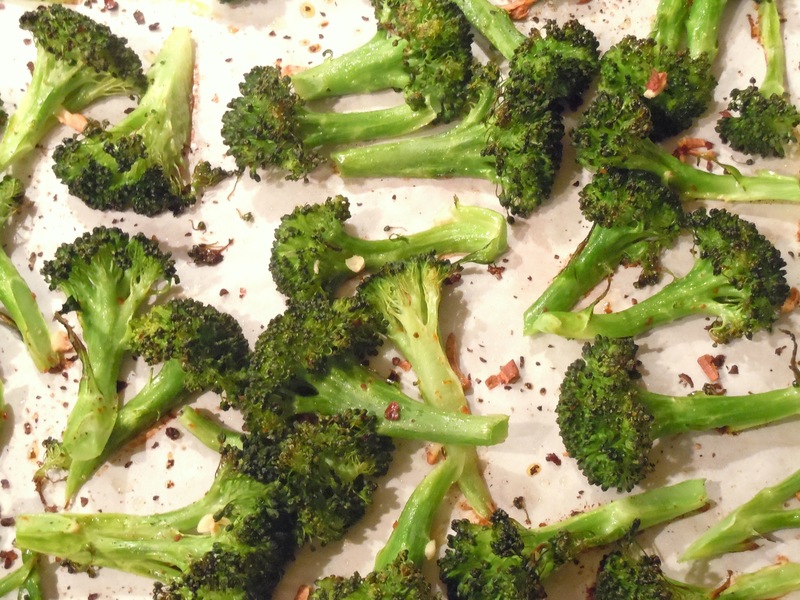 Heat the oven to 425 degrees F. Wash the broccoli; remove and discard the thick stems. (You could probably peel and slice the stems and roast them as well; I haven’t tried that yet.) Cut the heads into smallish florets with long stems. Slice really thick florets in half so they’ll cook evenly. Place all the florets on a kitchen towel and gently rub them to remove as much moisture as possible. Dump the florets on a cookie sheet and drizzle with 2 tbs. olive oil. Massage it gently into the broccoli. You want the broccoli to be evenly and very lightly coated with oil. Add a little more oil if you need it. Spread the florets out into one layer. Sprinkle with salt, pepper, and garlic if you’re using it. Roast for 10 minutes, give the broccoli a good stir to redistribute, and roast for about 5 minutes longer until the broccoli is crisp-tender and has browned spots. This entry was posted in baked goods, main courses and tagged bacon, broccoli, cheddar, cheese, eggs, pie, quiche. Bookmark the permalink. Oh, lovely! A good quiche is hard to beat. What was all that nonsense about real men not eating it? Joy Cardin is talking bacon on WPR tomorrow morning, I learned via Twitter. I’m teaching a smoking basics class at the Hay River Transition Initiative’s Traditional and Green Skills Event on March 3.